The Royale Coach Club is a chapter of the Family Motor Coach Association and exists for the enjoyment of its members. We are a diverse group of people who love to travel, eat and have a good time. We gather twice a year in some part of our great country to catch up on old friendships and to make new ones. 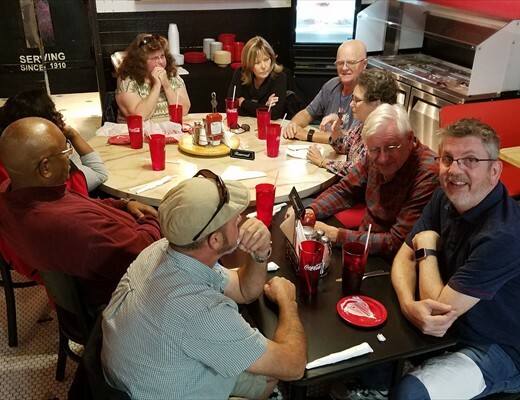 Each rally is hosted by a club member and includes visits to local attractions, catered meals, and lots of fellowship and fun. The club began in 1998 when 31 Royale coaches met at Walt Disney World. Since then, we have grown to over 100 members. A newsletter is published after each rally that provides the opportunity to share photos, technical information, favorite recipes, and fond memories. The Royale Coach Club is grateful and proud to have Millennium Luxury Coach as a sponsor, and is appreciative of the support provided at each rally by Prevost. All owners of a Royale Coach by Monaco are invited to join the Royale Coach Club. In addition, a Royale Coach Club member may sponsor an owner of any Prevost conversion coach to become a member of the club. Current membership in the Family Motor Coach Association is required. Our initial membership fee of $55 covers the initiation fee, name badges, and dues for three years. After that, dues are $30 every three years. To join the Royale Coach Club, please complete a Membership Application.